"A year ago all the magazines said that Yu-Gi-Oh was going to be the show that finally dethroned Pokemon. Funny how DragonBall Z and Cardcaptors did that. 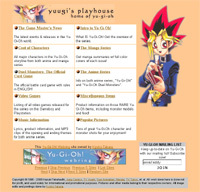 But for the curious, Yuugi's Playhouse is one of the leading sources for getting in the know about what's going on in the Yu-Gi-Oh universe. From info on the characters to release info, this site has a simple layout that makes surfing the pages for info a breeze. Sure, there's a lot more that could be added. But for anyone curious for info, this sites one of the best places to start." "Well, from a web designer's standpoint, the site's layout is pretty unintuitive. It's not necessarily a bad thing -- it's easy to navigate and easy on the eyes, and that's what REALLY matters -- but when you're trying to warm someone up to something new (like Yu-Gi-Oh) I think it helps to add a little slickness to it just to set the mood. But hey, to each his own. Some people like it plain. The information is rock-solid, the images add some nice 'mood' to the site, and all the different features of the site are informative and well-done. All things considered, it's a great-quality site that would make a great foundation of learning for someone new to Yu-Gi-Oh, or an information site for those already in the know. ^_^"
"This site seems to be trim and cut just right. A nice, clean layout showcases the wide-variety of information and detail about the particular series; Such a site can be compared to that of the famous Hitoshi Doi. I feel that this site has great potential, and will have more so when it is completed in it's full form. Good luck to the webmaster!" "Boy, you just don't see that color of peachy-sand used on very many web sites. It's nice... and unique. Content wise, this site is very comprehensive. I knew next to nothing about this series, and still found it helpful and informative. The technical execution is also very well done. It shows a sophisticated level of design, harmonizing form as well as function. Overall, a very high quality site busting with information! Good loading times to boot." "I think the site was pretty informative and thorough, however there are a few broken links and pics scattered throughout the site. No word though on when the site was last updated, or if there are plans to continue work. I hope the webmaster does finish this page though, it has alot of potential." "As a former collectible card game shark and manga lover, Yu-Gi-Oh has peaked my curiosity. I've been aware of the manga for quite some time, but never really understood the game, or how it all ties back to the manga. Yuugi's Playhouse is the best site I've seen that covers all the bases. The character descriptions are excellent, and the game rules in english, although still incomplete, are a great feature. The site is still missing a lot of sections, and the episode lists and theme song lyrics don't mean all that much as they're in Japanese, but it's still a very good start. There's a good chance we'll all be seeing a lot more Yu-Gi-Oh soon, so you might as well check this site out." "I like Yuugi's Playhouse. The layout is clean and the graphics are eye catchingly bright. Overall, the site's simple design is very attractive. YP is also very informative, with lots of pictures, info, and MP3 clips. The only thing that I can see that would help the site would be movie clips. I hadn't heard of Yu-Gi-Oh! before coming to Yuugi's Playhouse and I haven't been fond of the shows trying to ride Pokemon's coat-tails, but YP's convinced me to stop being so pigheaded and to check this series out."